Teaching is one of the main ways Southern Studies alumni use their degrees. Perhaps a quarter— perhaps even a third—of all Southern Studies alumni have gone into education, some in teaching, some in administration. Growing numbers have college and university teaching positions, and four Southern Studies MA students in the past two years took classes taught by SST alumni. Many teach in high schools and middle schools. Some just teach occasionally. For example, this summer Amy Evans Streeter (MA 2003) taught a workshop for graduate students interested in foodways oral history techniques, Cathryn Stout (MA 2011) taught writing to middle school students in a summer program in Connecticut, and Sudye Cauthen (MA 1993) teaches workshops on oral history and memoir. Bert Way (MA 1999) has a new job teaching History at Kennesaw State University and a new University of Georgia Press book, Conserving Southern Longleaf, and Nattoria Kennell Foster (MA 2011) will be teaching high school English in Marks, Mississippi. For this article, I asked three questions of a few of our teaching alumni: what subjects and at what level do they teach, and how—if at all—does their Southern Studies degree affect their teaching? Many teach classes in Southern Studies or in closely related fields. Sarah Alford Ballard (MA 2003), who after starting her career in the Mississippi Teachers Corp now teaches English at Murrah High School in Jackson, incorporates Southern literature into her World Literature and American Literature classes. Molly McGehee (MA 2000) teaches Southern Studies courses in her position in the English Department at Presbyterian College in Clinton, South Carolina. 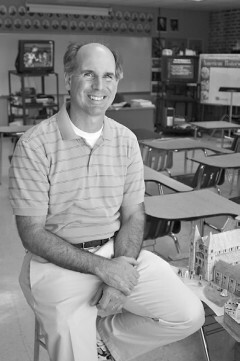 Along with courses in U.S. History and Government, Chuck Yarbrough (MA 1995) teaches an interdisciplinary Mississippi Crossroads course at the Mississippi School of Math and Science in Columbus. Some stressed that their teaching methods continue things they found especially appealing in Southern Studies. Buddy Harris (MA 2001) practices what he calls “applied Southern Studies” in his work at North Carolina Central University, where he does research in “things like mobilizing rural churches to prepare for natural disasters” and teaches Introduction to Composition classes.